For many moms, nap time is work time. When my kids are getting some zzz's, I am up in our third floor attic office space trying to get some work done. It's kind of hard to concentrate when you have that laundry, dinner, and messy kids room in the back of your mind! At least now I don't have to also intently listen to whether anyone woke up yet or if it's the neighbor's kids crying. 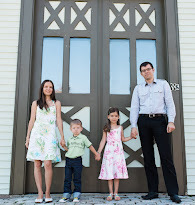 I am so thankful to have the Summer Infant Slim & Secure Monitor to help me out now! Before having kids, I thought monitors were for overprotective helicopter parents who don't leave their kids out of sight for a split second. Yeah. Then I had kids. It's amazing how handy these can be when your baby is napping and you're getting work done or when you have two or more babies playing in a child-proof room while you're making dinner. I especially wasn't thinking of parents who live in two or three story homes and sometimes it's just a matter of logistics! I can't hear anything on the third floor when the AC is on. So a baby monitor became a necessity. 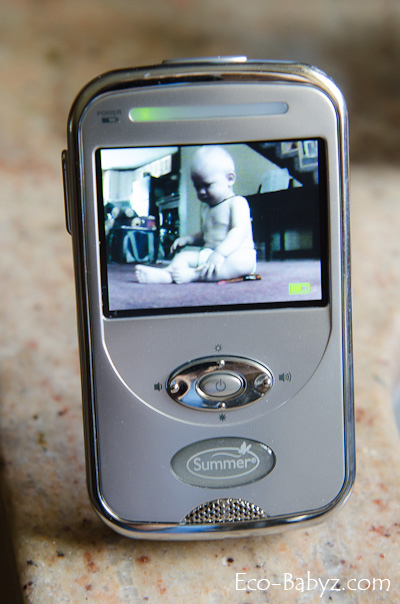 I love the design of the Summer Infant Slim & Secure Monitor. My toddler calls it a 'smart phone', and it does resemble one. We don't actually have smart phones, grandma does though and our toddler grew to enjoy little gadgets. It comes with a camera unit and video unit (pictured in the photos). The display is high enough quality that you can see what's going on. I unpacked the monitor and set it up to use right out of the box, it was super easy. No complex setup instructions or anything, I didn't even look at the instructions at first and wanted to see how intuitive it would be - it definitely passed that test! I really love that the video/sound unit is portable and when I need to move about, I can just disconnect it from the power cord and take it with me, clip it on my pants, and just keep the sound on to conserve battery life. Now I can go from doing laundry to working upstairs, all the while hearing if the baby wakes up no matter where I am. As you can see in the photos, the display is best when the light falls on the subject, obviously. But even if you have a window behind the subject (photo below), it's still a good enough display to see what's going on. Convenient power on/off feature that keeps the unit from turning on/off if my child just presses a button. You have to press and hold it for a few seconds for it to turn on or off. Even an awesome product such as this can be improved upon. I would have loved to have a 'talk-back' feature so that it could be used as an intercom of sorts. Like when I see in the monitor that my toddler takes her wooden flute and starts hitting her brother with it - it would be nice to be able to ask her to stop without having to run to the room. But even without it, she now knows I'm always watching! So she's a lot less likely to do something she knows she isn't supposed to. 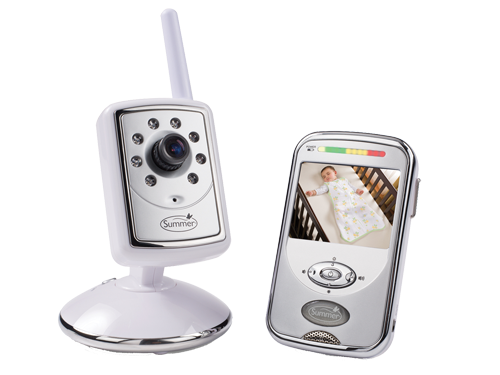 Summer Infant has just come out with a new baby monitor system as well! It's pretty high tech and still easy to use. The Peek Plus Internet Baby Monitor System allows you to view your baby from all your digital devices such as a smart phone, laptop or pc, or tablet in addition to a portable video unit. 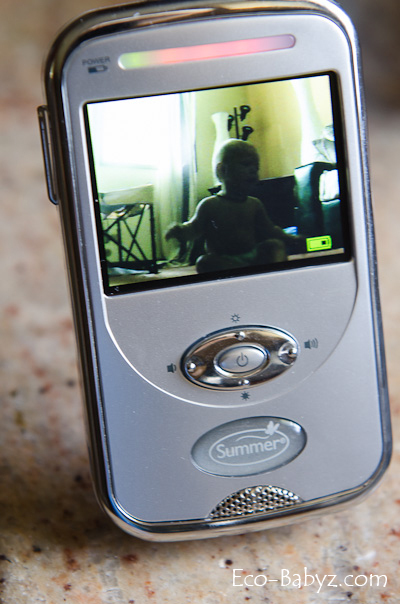 Now you can see what your baby sitter is up to from your office or while you're food shopping. Pretty neat idea! I love the look of the hand-held unit! It is very sleek! :) I also love that it's easy to "setup" and use, perfect for our home!